My daughter and I recently attended your Horsemanship clinic and thoroughly enjoyed it. You had both of our horses listening to us better than I ever imagined possible. One of my horses had never done any lateral work and you had us side passing beautifully. Thank you for being so articulate and breaking difficult maneuvers into steps we could understand. I highly recommend your clinics. I just wanted to thank you again for her wonderful start in partnership with humans. She is everything and more than my highest hopes to find again after having two such loving and kind horse partners in the past. The first mare I had for 34 years, the second I had for only 20 years, but they were such true soul mates and I believe Bella will be everything they were and more. Just an update on Dyno, he is amazing. He has already bonded with everyone. We can not go outside without him neighing at us and he won't stop neighing until we go up to him and pet him. He is such a laid back horse, nothing really seems to bother him. [...] Thanks for all of the hard work you put into Dyno! 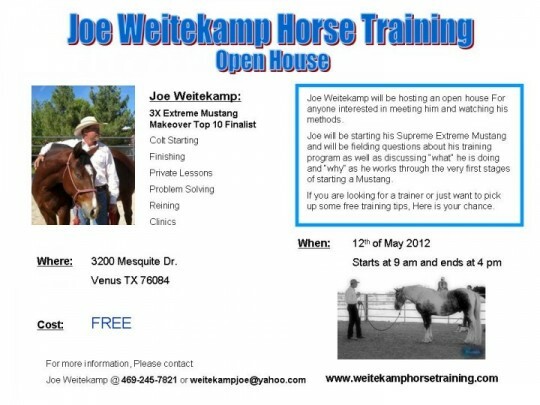 professional horse training throughout the Dallas / Fort Worth metro area.